Thirty Eight: LIVE! San Diego and Moving Weekend Hype! Episode Thirty Eight: Live! San Diego Comic Con and Moving Weekend Hype! We record at Christopher’s house in Phoenix. AZ. Patrick is in town as we help our parents move out of our childhood home. Discussed: Christopher and Andrew report on San Diego Comic Con 2015. We detail our favorite moments from SDCC. The madness of Hall H is real. The hidden gems of the Comic Con experience and we made some friends! Shout to the VT Ladies, Brooke, Megan and Jordon! Seen: We all saw “Ant-Man” on July 17th. We are all pleasantly surprised at how much fun the movie turned out to be. It is a superhero heist movie that plays to the strengths of it’s comedic actor lead, Paul Rudd. It very nicely sets up Phase 3 movies to come. Patrick finished “Penny Dreadful” Season 2 and he is terrified like the rest of us. The highlight of this season is Billie Piper’s character’s transformation. Just watch. Read: Andrew is engrossed in James S.A. Covey’s “Leviathan Wakes” The Brothers will undertake to read the new DC Comics weekly, “Batman and Robin: Eternal” when it launches in October. Patrick firsts needs to finish “Batman: Eternal”. Played: All played “Rocket League”. It’s soccer with remote control cars. It’s frenetic and fun and has perfect controls. Christopher has played many many hours. Even watching matches is fun. We all watched Patrick play an online match and were cheering and getting truly obnoxious. Real Hooliganism! Andrew reports on big changes to “Destiny” coming in September. Hopefully, it will re-balance the game play in the best ways possible. Andrew FAILS. NO. NEW. TRIVIA. Chris saves the day though. This entry was posted in Podcasts and tagged Ant-Man, Rat Queens, San Diego Comic Con, SDCC on July 24, 2015 by BrothersGeekadmin. Plans for San Diego Comic Con are forming. Chris and Andrew detail their strategy to guarantee admission to Hall H on Friday July 10th. Christopher wants to love “Terminator: Genisys” but he doesn’t. He continues to enjoy “Dark Matter’ on the SyFy channel. Andrew can’t wait for the season finale of “Penny Dreadful” and he showers love on Billie Piper. Her character has become truly terrifying this season. Chris concurs, Patrick will get caught up. Patrick watches the Netflix anime “Knights of Sidonia”. It has some common sci-fi troupes. He also watches “Inside Out” and recommends it for all. Christopher has begun the 4th book in the “Expanse” series “Cibola Burn” so far it is not as compelling as the first 3 books. Andrew finishes “Dune”, erudite discussion ensues. All have read “Rat Queens” vol.1., literally so good. Go read it. Christopher dives back into “World of Warcraft” with its newest patch. He details the nautical fun he is having. Andrew reports on “Destiny” news. Bungie hasn’t had it easy for the past few weeks. Patrick describes a “Fallout Shelter” disastrous rad roach infestation. He has learned from his mistakes and it will Never. Happen. Again. Trivia: Name 5 of the Top Ten games on Twitch at the moment of the question. The Boys come close. 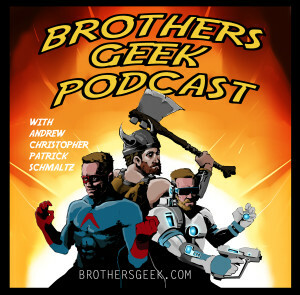 This entry was posted in Podcasts on July 7, 2015 by BrothersGeekadmin.